The Gorkha Janmukti Morcha and the Jana Andolan Party, two principal parties in the hills, have suggested the incorporation of additional areas from the Dooars in the proposed Kalimpong district. 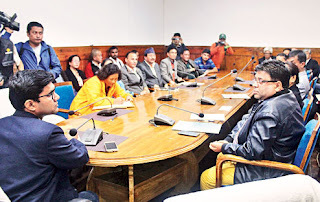 The proposals were made at an all-party meeting convened by Darjeeling district magistrate Anurag Srivastava here today to seek feedback on the creation of Kalimpong district and Mirik subdivision. Sipchu, Toribari, Bagracote Pathorjhora, Ellenbari,Chilauna and Samsing - the Dooars areas the Morcha wanted to be in the Kalimpong district - are part of some of the 398 mouzas the party had demanded to be brought under the GTA's jurisdiction. Roshan Giri, the general secretary of the Morcha, said: "We support the creation of Kalimpong district, a demand we had first raised. We want areas like Sipchu, Toribari, Bagracote Pathorjhora, Ellenbari,Chilauna and Samsing (which are presently in Jalpaiguri district) to be incorporated in the new district. These areas are contiguous to the present Kalimpong subdivision." Giri said the Morcha wanted three subdivisions and seven blocks in the new district, and three blocks in Mirik subdivision. Anmole Prasad, a member of the JAP's bureau, said the party had made a written submission on various aspects of the formation of the Kalimpong district. The JAP also wants parts of the Jalpaiguri district to be included in the new district. "We want the boundaries of the new district to be redrawn so that its two sides have highways and a compact zone is created," said Prasad. The JAP basically wants areas lying north of NH31 in Jalpaiguri district to be the southern boundary of the Kalimpong district and areas like Kalijhora, Lohapul, Suntalay and Rambi, which are along NH10 and in the Kurseong subdivision, to be the western border. The JAP wants Kalimpong district to have three subdivisions and 10 blocks. The party demanded at the meeting that four blocks be created to make up the new Mirik subdivision. "We also seek the formation of a committee comprising stakeholders, NGOs, experts and citizens to monitor and assist the formation of the district and the subdivision. Future meetings should be held at respective locations (Kalimpong and Mirik) to enable detailed discussions and new administrative townships should be created there to de-congest the area," said Prasad. Representatives of parties like the GNLF, ABGL, CPRM and the Trinamul Congress also attended the meeting. Srivastava said the parties had been asked to submit the suggestions in writing by tomorrow evening.